In American cartography, the 37th parallel forms the northern border of Arizona and New Mexico. 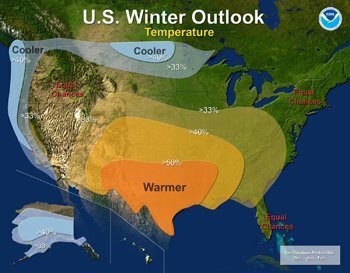 As the book closes on the winter of 2010-11, that line of latitude also roughly divides the western United States into two regions with very different hydrological concerns for the coming spring and summer. According to data from the National Water and Climate Center, an unusually intense La Niña precipitation pattern has parched much of the southern half of the Four Corners, stoking fears of wildfires and water shortages in Arizona and New Mexico. The El Niño Southern Oscillation (ENSO) climate pattern is a coupled ocean-atmosphere phenomenon consisting of El Niño and La Niña cycles. This season is being classified as a moderate-to-strong La Niña, following 2009’s especially intense El Niño year. La Niña occurs when water surface temperatures in the equatorial Pacific Ocean are colder than normal. The phenomenon typically brings drier and warmer conditions to the southern tier of the United States and wetter weather across the Midwest, Pacific Northwest, and the Northern Rockies, according to the National Oceanographic and Atmospheric Administration (NOAA). Back in December, Circle of Blue reported that the Climate Assessment for the Southwest (CLIMAS) program—a division of the University of Arizona Institute for the Environment—had launched the La Niña Drought Tracker, an online monthly publication featuring information on current and future drought conditions. The tool seems to have accurately predicted that this season’s La Niña could exacerbate drought-like conditions that have been plaguing parts of Arizona and northern Mexico for the past decade. “It’s been three or four decades since we’ve had a La Niña this strong,” said Jan Curtis, a climatologist with the National Water and Climate Center, in an interview with Circle of Blue. Curtis said the winter in New Mexico and Arizona was one of the driest on record. Arizona’s Gila River is projected to be at 21 percent of the historical median flow during the next two months, while its tributary the Salt River is projected to be at 15 percent of normal. Despite the scant precipitation, water users are buffered by last year’s wet season. A spokesman from the Salt River Project, which administers water contracts in central Arizona, told Circle of Blue that the system’s reservoirs are 88 percent full, and there will be no curtailment of water deliveries this year. That is not the case in New Mexico, where the Gallinas River Basin is already operating on a shortage schedule and where the city of Las Vegas has already imposed water-use restrictions. Karin Stangl, the communications director for the state engineer, told Circle of Blue that more basins may invoke shortage-induced sharing agreements if the early-summer monsoon does not provide relief. Elsewhere in the New Mexico, officials are dredging a channel in the Rio Grande to keep the river from stagnating and to reduce evaporative losses. Wildfires are of concern in both states, with some 30,000 acres having already burned in New Mexico and 8,500 in Arizona. And leftover brush from last year’s relatively quiet wildfire season could also prove problematic, especially since there is an overabundance of it thanks to last year’s wet El Niño winter, according to ABC News. A much different situation is unfolding to the north, where the other nine states west of the Rocky Mountains are celebrating an above-average snowpack. California’s governor lifted the state’s three-year-old drought restrictions, and irrigators will receive a larger share of their historical allocations. Even Lake Mead—a symbol of western water supply—will see a hydrologic reversal of fortune. The Bureau of Reclamation announced surplus water would raise the reservoir by nearly 30 feet this year—the first net annual gain since 2005. Yet, even in times of plenty, there is reason to worry. The deep snows bring warnings about spring floods and hydropower production in excess of what the grid can handle. On March 30, Governor Jerry Brown declared an end to drought restrictions enacted in 2008. Water content measurements indicate that the Sierra Nevada snowpack is 65 percent above normal, according to the state’s Department of Water Resources (DWR). Department officials estimate that deliveries from the State Water Project—which funnels water from the north to cities and farms in the south—will rise by 20 percentage points over last year. But all those farms in the San Joaquin Valley are located in an area with the highest flood risk in the state, said Jon Ericson, chief of hydrology for flood management at California’s DWR. Rivers flowing into the state’s agricultural heartland descend from high elevations, and the mountain reservoirs have little storage space compared to the mega-projects in northern California. Reservoir managers are doing the best they can to release water to make space for the coming deluge, Ericson told CoB. “They realize there is a monster snowpack and are trying to clear as much room as possible,” he said. The next several weeks are critical. If melting coincides with spring rains or warm weather, flood risk will be compounded and accelerated. So far the forecast is benign, but the potential for high runoff will persist through June, Ericson said. In March, a series of late-season snow storms in the Cascade Mountains ended fears of summer water shortages in the Columbia River Basin. While the deep powder has buoyed ski resort operators—some of whom believe they could be open through June—the heavy snowfall dismayed an unlikely group: wind turbine owners. Because of the surplus hydroelectricity that will be generated as the melting snow fills rivers and reservoirs, the government may temporarily shut down wind turbines in order to balance the load on the electrical grid, the Seattle Times reports. The proposal comes from the Bonneville Power Administration (BPA), the federal agency charged with managing the regional grid and marketing electricity from government hydropower projects. Wind producers are opposed to the measure because they would not be compensated for the revenue lost during the shutdowns. Ordinarily a dam operator could release excess water from its spillways, but doing so increases dissolved gases in the river. The BPA is limited in that regard by environmental regulations to protect salmon, so, instead, the water goes through the turbines and continues to generate electricity. The surplus power would usually be considered a boon because it could be sold to neighboring California, which uses more watts than it can produce. But with a good snow year throughout the West, along with cheap natural gas intervening, hydropower prices have collapsed and the supply glut is straining the grid. Robert Kahn, director of the Northwest & Intermountain Power Producers Coalition, told the Seattle Times that the Northwest has “way, way, way too much water” for power production right now.